Without anyone noticing, Formula Drift cars became quite possibly the most powerful racers of their kind in any competition anywhere in the world. How do I know this? 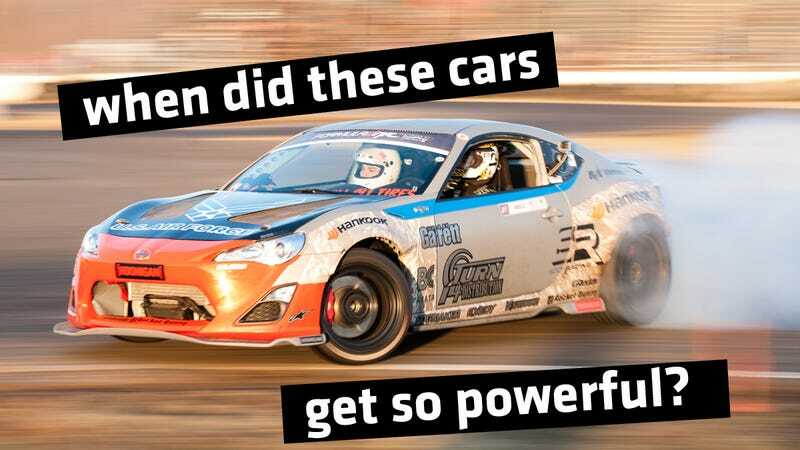 Because I drove Tony Angelo's 705 wheel horsepower Scion FR-S… and crashed it. I crashed an FD car. Well, that's not what's surprising. I had never driven any drift car of any kind before Tony Angelo put me in the seat of his competition car, a 705-horsepower, nitrous-shot Scion FR-S. It was a wet December afternoon at New Jersey's Englishtown Raceway Park. Everyone who knew anything about drifting (Tony included, as he later told me) took one look at me, the car, and the conditions and knew that I was going to go off track. That I went off wasn't a shock to anyone. What was a shock was that I drove the car at all. Nobody drives Formula Drift cars outside of the handful of guys who compete in the series. Until Saturday afternoon, the only person to put their foot down in Tony Angelo's FD car was Tony Angelo. And none of these guys let other people drive their cars because 1) these cars are a huge part of their owner's livelihoods, so it's potentially a huge financial burden if some idiot car writer crashes one and 2) any idiot car writer is definitely going to crash one because these cars are hugely difficult to drive. I'll start by saying this; Tony's car has a one-way locking differential. Tony explained to me that thanks to this differential, he has to be on the gas or on one of the two brakes at all times to slide the car the way he wants. There can be no down time. There can be no pauses. He took me for a passenger ride and it is completely unreal how manic it is inside. We launch off the starting line at E-Town. We spin the wheels in every gear. The Scion is not so much a vehicle as a solid box of noise. Tony turns in over a hundred yards before the first corner. Screeching. Wailing. He's pulling the handbrake what seems like dozens of times. He's stabbing the clutch pedal straight to the floor. Huge clouds of tire smoke are pouring out behind us. We're going up this hill in the first turn and it's like the car is fighting Tony. It feels like there's an invisible, giant hand of g-forces pushing on my side, against the slide. The thing is that even though Formula Drift cars are all about spinning the wheels, they actually have huge amounts of grip. The trick is that they have so much power that they can overpower even the grippiest setups. We crest the hill and I can see the next corner in the distance. We just went through a left hander, this coming one is a right hander. There is a decent-sized straightaway between them. Tony throws the car into the next turn the moment he leaves the first. I know Tony is a good driver. He's been drifting this specific track for over ten years. He's competed in Formula Drift longer than almost anyone else. I should trust him to make this next turn. No way in hell is he making this next turn. We are so sideways, so early that there is simply no way we won't spin out. It seems like ages before we're close enough that I can get a good view of this second turn at all. It doesn't look good. Inside the corner is a deep hole, dug out from cars cutting across the dirt. That dirt has turned into mud. That mud has been smeared all across the corner. My ears are ringing. We're skating over the mud and Tony is kicking the clutch, pulling the handbrake, mashing the gas, and fighting the wheel all at the same time. He's a blur of limbs. It feels like we're about to spin, but the spin never comes. We're just impossibly sideways, sliding through the corner all the way from one edge of the pavement to the other. Here is the video of that run. As I said, watch how early he initiates his slide for the first turn. It's unreal. There are many things that make Englishtown the best track I've ever been to. One of them is that the drifters here (the wonderful Club Loose) converted a little barn next to the road course into a dive bar. I'm going to skip ahead from my first passenger ride to Tony and I drinking beer at the trackside bar later that night. I ask him again to explain how FD cars like his evolved to be so fast. We used to take other race technology, real race technology and insert it into our cars, and it would be like, the baddest thing you ever did. Stephen Verdier [who ran a rear-drive Subaru some years ago] got basically like a World Rally Championship motor and that was real gnarly for the time. So that would be, like, a joke now. Tanner [Foust] was running a [Nascar] Sprint Cup motor in '08, and that was badass, but that would be literally a run-of-the-mill FD car now. In the early days, FD cars didn't have any top-level components from the big, serious motorsports. Then FD cars started getting that technology. Then FD cars started regularly breaking all of those components, components that were thought to be unbreakable. FD cars are now in uncharted territory for how powerful they are. The biggest development of the past year is nitrous. It can mean over a hundred horsepower bump for a turbo car like Tony's. His engine started life as a quiet, pedestrian Toyota 2AZ four-cylinder out of an old Scion coupe. The internals are all new, there's a turbo the size of my head, and all kinds of other wizardry I couldn't even begin to understand. Tony is now working with two times as much horsepower as he was in 2009 and three times as much torque. His current transmission is a four-speed dogbox out of a NASCAR road racer. His quick-change diff is from a dirt track sprint car. The car itself weighs around 2,520 pounds without a hundred-odd pounds of mandated ballast and Tony's 185 pounds of tattoos and Philadelphia muscle. One driver in Formula Drift is currently drifting with 1300 horsepower at the rear wheels. Another driver has seen 1200 on the charts, but he hasn't found a dyno where he doesn't spin his wheels. These cars are on par with the most powerful sports racing cars ever built and with the most powerful Formula One cars ever built. As far as I know, there is no other series in the world today competing on circuits and with closed-wheel, unibody cars [you can read that as regular cars like the ones you buy from a dealership] with this much power. Take a look at Jalopnik's chart showing how the world's race cars compare to each other and you'll see what I mean. Any road racing Ferrari, Porsche, BMW, or McLaren couldn't even get around a Formula Drift track these days. Current Formula Drift cars still look like the same old slow drifters with the same old big wings and the same old flashy paint jobs that they've had since the earliest Fast and the Furious days. Formula Drift's organizers still advertise their series' cars like they were still old and slow. Hardly anyone outside of the shops that build FD cars know that under the neons and stickers skin, these cars have become monsters. Tony gets into the passenger seat this time and I get behind the wheel. Luckily we're about the same size, so all the pedals are set up just where I'd like. The steering wheel is right where it should be, and I can see perfectly fine. We pull onto the back course, tighter and more technical than E-Town's main course. There are puddles and patches of mud at every turn. I'm worried about spinning the car out from the back, but all of this water and dirt means I should be worried about sliding at the front, skidding straight off the track. And that's exactly what happens, almost immediately after I set off. The car is a complete overload even in a straight line. The engine is blaring and just as fast as I get through one gear, the car speeds through the next one. I'm shifting as fast as I can, and as we come down from one hill, I try to throw the car into a wide left-hander, just like I watched Tony do. Amazingly, once the car is back on the track, Tony lets me back in the driver's seat. I go again. I'm trying to feel the car, but I really have no clue what I'm doing. I have a vague idea that if I mash the gas the car will spin its wheels, or if I pull the handbrake it will slide, or if I kick the clutch it will throw the car more sideways than anything else. I can say those things in my head like I know what I'm talking about, but when I'm sat in this hurricane on wheels, nothing makes any sense. And then, after another two laps, things get worse. The first turn on the back course is the dirtiest of all. There's gravel all across the entry. There's mud all through the exit. I'm shooting down the straight leading up to the corner. I turn in, I pull at the handbrake, and the moment the car hits the gravel, the front washes wide. I try and catch it, but I'm already two steps behind the car. I get on the gas to try and bring the back around, but I am too low in second gear to spin the back tires. More gas is only speeding us up, not making us slide. I lift off, hoping the front will come back, but it doesn't. I brake and commit. We're going off track and we're headed for the woods. In front of us are trees, a ditch, a heavy metal railing, and a line of bushes. Somehow, we stop short of the bushes and don't hit anything solid. There is mud everywhere. Grass is sticking out all over the bottom of the car. We need a tow and we need to clean the car. "So you're a lucky man," the guy in the truck says, pulling up with a tow cable and a huge grin. "You crashed an FD car!" Back in the pits it turns out that the car doesn't just need a wash. Tony hears that the exhaust sounds different, but it's not a simple leak. The exhaust is broken, specifically some rock cracked the turbo wastegate all the way off the exhaust manifold. We didn't crash into any trees. Nobody was hurt. The car is done for the day and done for the weekend. Tony tells me that it's fine, that it was inevitable that we'd go off track, that I shouldn't beat myself up for it. I sheepishly ask Tony how much time I had with the car. He tells me that the session we were in probably lasted an hour. "So I could've spent, like, way more time just getting used to the car," I say. Tony looked at me. "Yeah." That bit still hurts to think about. Actually, what hurts even worse is what I told Tony before I got to drive. He tells me that I don't have to drive it very hard, that it's fine if I just want to feel it out for a while and see what it can do. "My first goal is just not to break it," I tell him. He said, "that'd be nice." I'm one of maybe two people who aren't FD drivers who've gotten behind the wheel of a brand-new FD car. And I crashed it in maybe ten minutes. But like I said, that's not really a surprise. After all, this is one of the most powerful cars of its type anywhere in the world. Photo Credits: All pictures of the car on track were taken by Adam McVicker. Find more of his work right here. All pictures of the car in the pits and the blurry cellphone shot of it in the dirt were taken by me, Raphael Orlove. Video Credits: Side-mounted GoPro video of Tony driving comes from Jonathan Corujo. Find his work at JTC Design. Rear-mounted video of me driving (and crashing) comes from Henry Carr. Find his work right here. Thanks to the drifters at Club Loose for organizing yet another excellent drift event. You can check out their website right here and their Facebook page right here. You can find Tony Angelo right here on Instagram, right here on Twitter and right here on Facebook. In addition to shredding tires and building cars, he also has an extremely adorable Rottweiler named Panic, so follow him.